lives in Paris Chantal Akerman is known as a film maker, but in the past few years she has re-used images from her feature films and documentaries for her own form of visual arts, namely video installations with an interaction between the different screens or monitors. These works don’t belong in a film theatre, but in museums and exhibitions. Paris, 1995. On the cutting table in a modest office building in central Paris lie Juliette Binoche and William Hurt in Un Divan à New York. Chantal Akerman Par Chantal Akerman is also almost finished. It’s a self-portrait for the series Cinéma de Notre Temps by order of La sept Arte and producer Thierry Garrel. Because who can tell more about Chantal Akerman than Chantal Akerman herself. Through the open windows we can hear shreds of sounds from other cutting tables gathering in the inner courtyard. Fall is still warm. An interview on too much and not enough cinema. Chris Dercon: A lot of films on films have been made. Godard is a good example. Chantal Akerman: It’s not just films on films, they are films. Godard makes Godard about himself. But when Godard speaks about himself, it’s sometimes very alarming. You can see him excluding himself from the world in an almost autistic manner. For people like me, who started doing film because of him, it is a terrible fright. And the fact that the long evolution that Godard has been through can lead to this, almost brings me to despair. He was kind of a pioneer, an inventor who didn’t care much about anybody or anything. And that a man at this stage of his life isolates himself, should also be a lesson for us other film makers. Because it’s true, it’s not easy to make films, you have to deal with so many things and people. People who say yes, people who say no. With the processing lab, that sometimes understands, but usually doesn’t. And Godard, what does he do? He is left alone, with his housekeeper. It is tempting of course to be alone with only a housekeeper around you. CD: You are a lot more optimistic. Also in D'Est there is an optimistic attitude to life. CA: It is a monument for people who had to live within a system. I am also talking about a courageous man like producer Thierry Garrel, who has to function within the system of television. What remains for us film makers, are only the film festivals. But they are just like a bombastic cake. There are people like me who discovered film in a whole other way. I come from a family that was not interested in cinema, literature or music. When I was fifteen, I was walking on the Anspach avenue in Brussels and there was a film theatre "Marivaux". In Flemish Pierrot de gangster! was announced, in French Pierrot le fou! I liked the title. I wasn’t sixteen yet so I wasn’t allowed to get in. I was very small, even smaller than now. I said to my friend: we’ll try anyway. And I saw a film, for the first time in my life. I had only seen things like Le gendarme de Saint-Tropez or The guns van Navarone. But I didn’t enjoy those things. There was nothing to that kind of cinema except ice cream and making out. And then I saw something like this, as beautiful as a literary work, a poem. I went outside and decided I would make films. It didn’t happen at some kind of festival. There was a girl that didn’t know anything, walked into a film theatre on a Saturday night and met Godard. CA: I made my first film Saute Ma Ville when I was eighteen. That was in 1968. At that time succeeding on the market was not an issue. Godard, Rohmer and the others are all older that 60 now. They are physically and mentally tired. I am younger than them, but I am tired already. I Sometimes feel I have reached the end of what I can do and what I can give. That is why it’s so agreeable to work in museums. There is a playful element involved. One thing leads to another, it’s a form of energy. That’s why I like writing and doing other things than making films. CD: Is cinema slowly coming to an end? CD: Les Années 80 was a sort of fictional documentary? CA: There is a practical explanation for that. I was filming auditions and they looked so interesting that it would be a shame not to use them. I edited them and then something happened. It looks almost magical. CD: In most of your films there is a form a fiction that seems to be in an embryonic stadium. Where does fiction begin for you? With a wink or with the striking of a match? CA: No, I wouldn’t want to describe it that way. It’s not even a sort of crossing of borders. You slip to one side or the other. Anyway, I don’t really believe in the difference between documentary and fiction. Take for example a film with Marilyn Monroe. If you look at it 20 years later, it has become a documentary on Marilyn Monroe, the way she rolls her eyes, moves her arms. And of course it’s also a document of an era. The same goes for the material in which a film is made, the grain of the celluloid tells us just as much about the period or the breath of an actor. I hardly or don’t ever make a difference between documentary and fiction. Of course it’s easier to claim such things by referring to the past instead of things that are made now. Fiction departs from a certain tension that is created, things that evolve, a subject looking for an object. CD: A distinct beginning and ending? CA: Apparently Asiatic films didn’t seem to care about those things for a long time. All that has changed of course since the Americanisation or Europeanisation of the Asiatic film. But before that an Asiatic film could start somewhere in the middle. Those film makers didn’t follow a strict line. They could start somewhere or nowhere and end somewhere completely else. This brings me back to a filmic sequence I like to use myself and which looks typical for a documentary at first. I sometimes keep to one shot for a long time. A certain tension builds up between the beginning and the end of that shot, which immediately looks like fiction. It is indeed difficult to escape from fiction. But in the same way it’s also difficult to escape from the documentary style. CD: It seems like you tell and show at the same time. CA: I want the spectator to have a physical experience, for him or her to feel time. Films are generally made to literally and metaphorically pass the time. But I want you to experience the time of a character. I don’t want you to just go through an emotional experience, but also another kind of experience, like with music, that is unique because it is purely physical. CD: What’s the difference between D'Est as a film and as an installation? 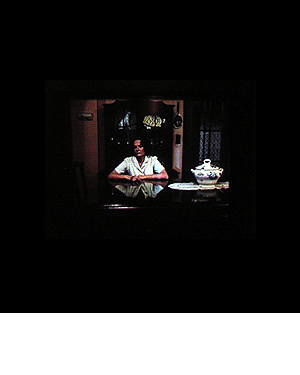 CA: The film passes on the screen with 24 images per second. If people want to see the film according to a certain route that I have laid out for them, they have to watch 110 minutes. In the installation with the video screens, people can come and go as they like. They stop for a moment, they continue and so on. You can always see something different and in another way. And I myself have also attained more freedom. These installations in museums and exhibitions don’t immediately have to raise money. I can always do different things. I receive an invitation to do something. I can say yes or no. And we’ll see what happens or when. And of course there is the intense pleasure of ‘the first time’.